Anna and Eugeni Bach's architecture firm has designed the renovation of a small corner apartment in Barcelona. Anna and Eugeni Bach's architecture firm has designed the renovation of a small corner apartment in Barcelona. A very delicate refurbishment project where many of the original features have been retained and that is designed for a different end use in the future. A renovation that not only makes the most of the existing original in the Eixample district of Barcelona but is also a project that really looks straight into the future. Cabinet Studio Apartment by Anna and Eugeni Bach is a moderately-sized architectural project for a 77-square-metre area that will be highly sustainable in the long term. 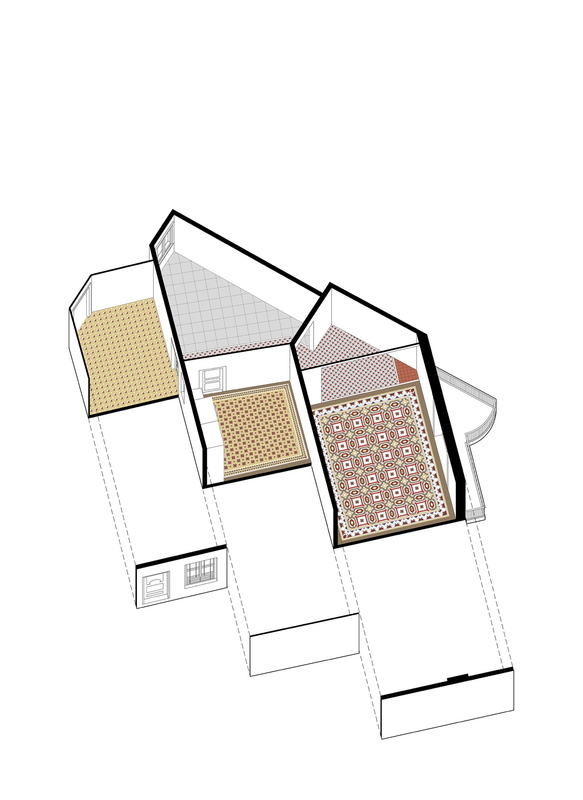 The clients want to use this small corner apartment as a studio for the next 15 years, then as their retirement home. The particular style and layout of the home is due specifically to its position in the urban fabric of the Eixample district. This landmark area is distinguished by the buildings of the Catalan Art Nouveau period - Modernism - which first emerged in 1850 with the onset of industrialisation. Barcelona had no more room to accommodate the rapidly growing population so it expanded outside the city walls into districts where people could live and work. During that period, the surprising chessboard pattern of the Eixample, which means extension in Catalan, was designed by the urban planner and civil engineer, Ildefons Cerdà. Cerdà based his design on the layouts of American cities, with wide streets and large intersections separating apartment blocks with rounded corners to mark out the road grid even further. The apartment that Anna and Eugeni Bach refurbished is situated in one of these blocks. The client brief was for a dual-purpose apartment - first as a studio, then as a home for when they retire - which, of course, required as much flexibility as possible. So, the architects decided to group together the kitchen and bathroom services in a single area, with the roof of the timber volume that houses the bathroom now set aside for storage and accessible by a narrow staircase. In the future, this loft area can be turned into a sleeping zone for visiting grandchildren. It has all been completed following the 45° logic of a corner apartment, in other words opting for bespoke solutions. Apart from this addition and the functional grouping together of the kitchen and bathroom, the rest of the apartment has basically been left intact. The floors, ceilings and mouldings were all in good condition so they were simply cleaned up and act as a clear contrast with the new timber kitchen and bathroom area. This contrast sets up a connection between the two directions of the corner apartment, as well as between the home's two future uses. A project of extreme sensitivity both with regard to the restricted spaces and their adaptation to the dual needs of the clients and to the enhancement of the recovered materials, making Cabinet Studio Apartment - photographed by the architect Eugeni Bach himself - a small gem of a modern, attractive and practical refurbishment.